What if the conflict that erupted 50 years ago this week between Israel and its largest Arab neighbors – Egypt, Syria, and Jordan—had gone the other way? What if there had been no Israeli conquest of Gaza and the Sinai Peninsula, of the Golan Heights, or of eastern Jerusalem and the West Bank? What if Israel's prolonged rule over the Palestinians had never begun, and no Jewish settlements were ever built, and no Zionist impediment to Palestinian statehood ever existed? There would be no Palestinian state. And there would be no Jewish state. 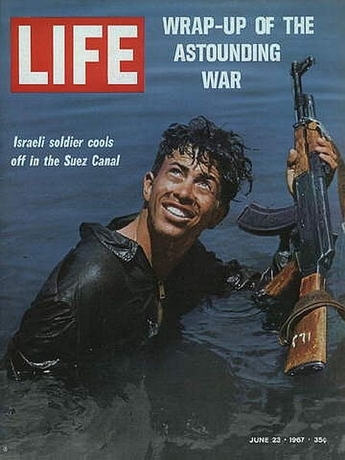 The Arabs didn't provoke war with Israel in 1967 to achieve Palestinian independence. An Arab state in Palestine had been proposed by the United Nations 20 years earlier, but the Arab world vehemently rejected the idea. Since 1949, the West Bank and eastern Jerusalem had been occupied by Jordan; the Gaza Strip was under Egyptian military control. Arab rulers could have established a Palestinian state in those territories whenever they chose to do so. But Palestinian statehood was of no interest to them. There was, to be sure, a "Palestinian" movement. In Cairo in 1964, the Arab League had created the Palestine Liberation Organization; Ahmed Shukairy, an Arab League functionary loyal to Egyptian President Gamal Abdel Nasser, became its first chairman. But the PLO's purpose was not to win Palestinian independence; it was to assist the Arab bloc in eliminating Israel and the Jews from the Middle East. Like the Arab governments it answered to, the PLO clamored for genocide. "D-Day is approaching," proclaimed Shukairy on May 27, 1967. "The Arabs have waited 19 years for this and will not flinch from the war of liberation." A few days later he was even more explicit. "We shall destroy Israel and its inhabitants," the PLO chairman declared in a blistering sermon in Jerusalem on June 1. "As for the survivors — if there are any — the boats are ready to deport them." Shukairy's rhetoric was typical. Arab leaders across the Middle East routinely spoke of Israel's very existence as a humiliation to be expunged. In a broadcast two weeks before the war broke out, Syria's government announced: "The Arab people's decision is unfaltering: to wipe Israel off the face of the map." On May 18, Egypt's Voice of the Arabs radio station vowed: "The sole method we shall apply against Israel is total war, which will result in the extermination of Zionist existence." The Iraqi president, Abdel Rahman Aref, described the coming war as "our opportunity to wipe out the ignominy which has been with us since 1948. Our goal is clear — to wipe Israel off the map." 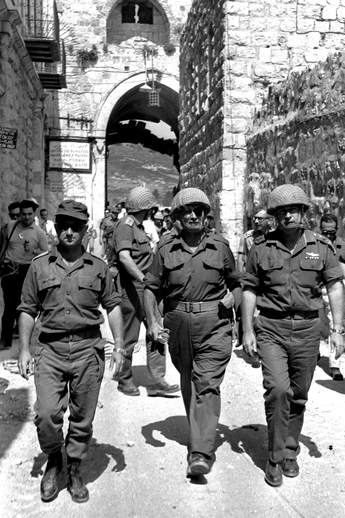 (L to R): Israeli General Uzi Narkiss, Defense Minister Moshe Dayan, and Chief of Staff Yitzhak Rabin enter the Old City of Jerusalem through the Lion's Gate during the Six-Day War. There was no ambiguity about the Arab leaders' annihilationist goals. In the weeks before the Six-Day War, they reiterated them again and again. And the bellicose words were backed up with deeds: Egypt blockaded the Straits of Tiran, cutting off Israel from its southern lifeline. Nasser demanded that UN peacekeeping troops in the Sinai Peninsula be removed, and began deploying military divisions on Israel's border as soon as they were gone. Syria and Jordan, too, massed troops along the Jewish state's border — which, at its narrowest, was just nine miles wide. Israel was alone, surrounded by enemies baying for Jewish blood. Many accounts have detailed the anxiety, uncertainty, and panic that gripped Israeli leaders in those weeks. The fear of a second Holocaust was palpable. Across the country, thousands of graves were dug in preparation for the terrible slaughter to come. What came instead was victory on a biblical scale — a victory that astonished Israel and the world. Fifty Junes later, the context of that triumph is mostly forgotten, and Israeli-Arab tensions still bedevil the Middle East. If the Six-Day War had gone the other way, it is fair to say, those tensions wouldn't exist now. Then again, neither would Israel.